" Get ready for a new kind of car, a new kind of experience. 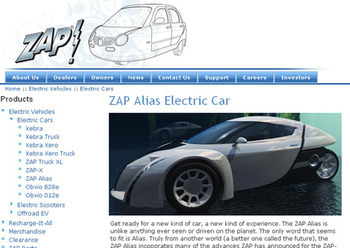 The ZAP Alias is unlike anything ever seen or driven on the planet. The only word that seems to fit is Alias. Truly from another world (a better one called the future), the ZAP Alias incoporates many of the advances ZAP has announced for the ZAP-X, but in a smaller, sportier oval design that amps up the performance while creating a transportation alternative that can be economical and functional. This unique, two-passenger vehicle uses an advanced wheel-motor drive system capable of unprecedented acceleration and handling in street-legal vehicles. With a top speed of 120 miles per hour and a range of 100 miles, the Alias will redefine driving like no other vehicle in history. "